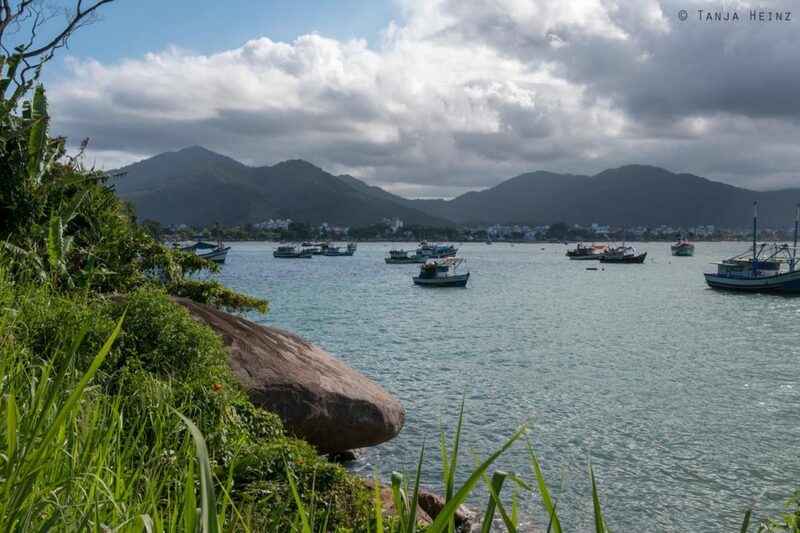 If you want to know more about the protection of marine turtles in Brazil, one of the most important contact point in Brazil is the Projeto TAMAR. As I wanted to know more about marine turtles in Brazil, I visited the Projeto TAMAR in Ubatuba. 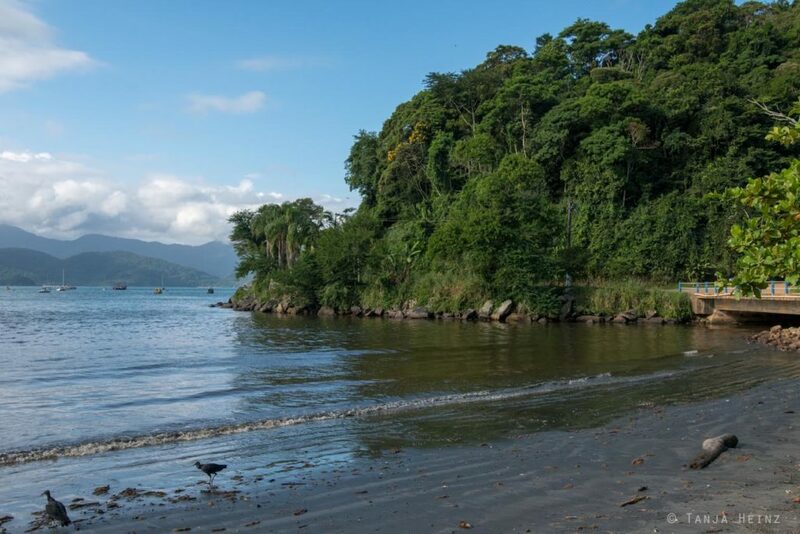 Before I visited the Projeto TAMAR in Ubatuba, I had already been at the visitor centers in the Reserva Biológica de Comboios close to Linhares and in Vitória. While these two visitor centers are located in the state Espírito Santo, the one in Ubatuba is situated in São Paulo. However, when compared to the other two visitor centers there is one little thing that makes the visitor center in Ubatuba special. They host an albino marine turtle. 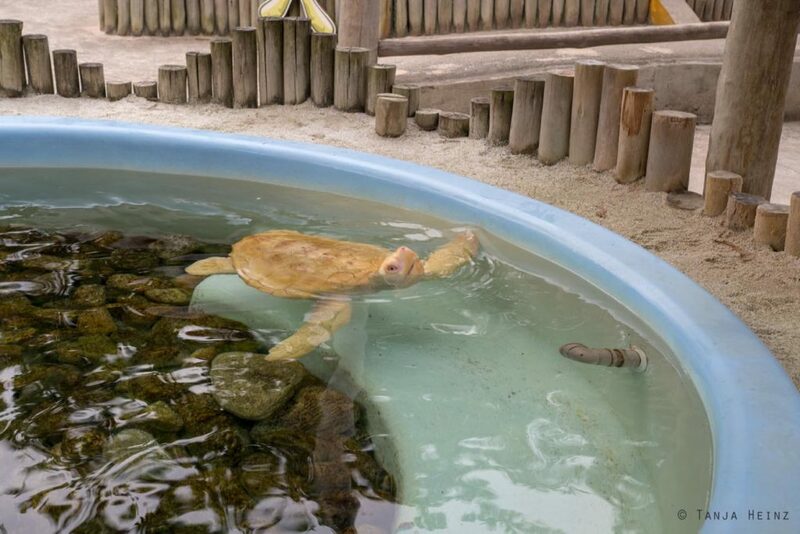 I would have visited the Projeto TAMAR in Ubatuba anyway – with or without an albino marine turtle to see – but still it was an interesting encounter for me. 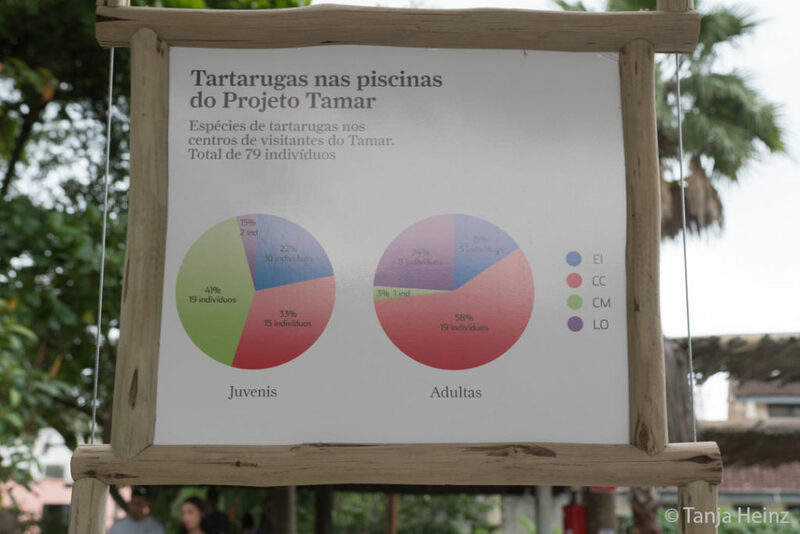 Before I will tell more about the albino marine turtle in Ubatuba, I give you some more information about the Projeto TAMAR (in case of haven’t read my previous articles). As mentioned above, the Projeto TAMAR is a very important contact point with respect to marine turtles in Brazil. 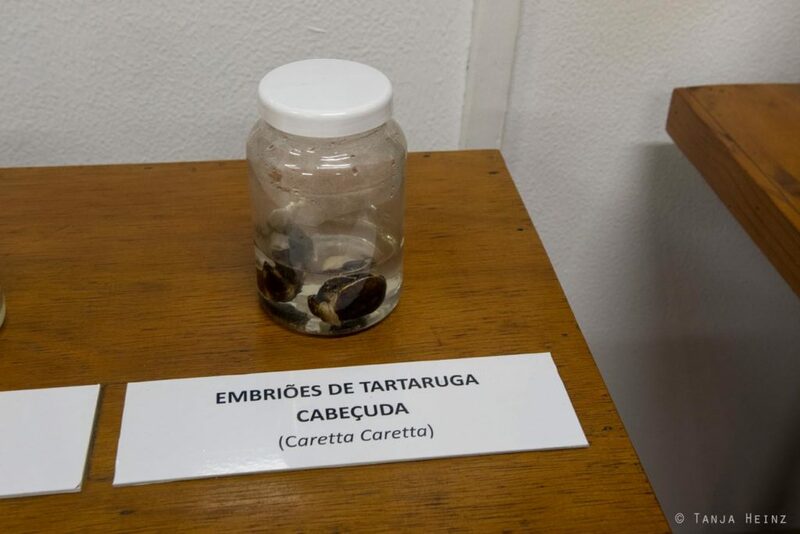 However, here it is also important to mention that the Projeto TAMAR is not a zoo, as no marine turtles are taken from the wild to be shown in the visitor centers. 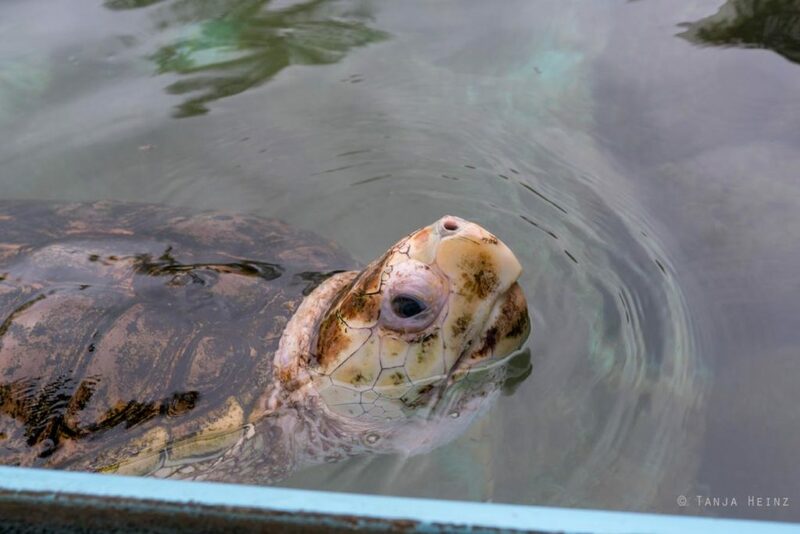 A marine turtle comes to the visitor center of the Projeto TAMAR only if it does not have good chances of survival in its natural environment (like for example the albino marine turtle). 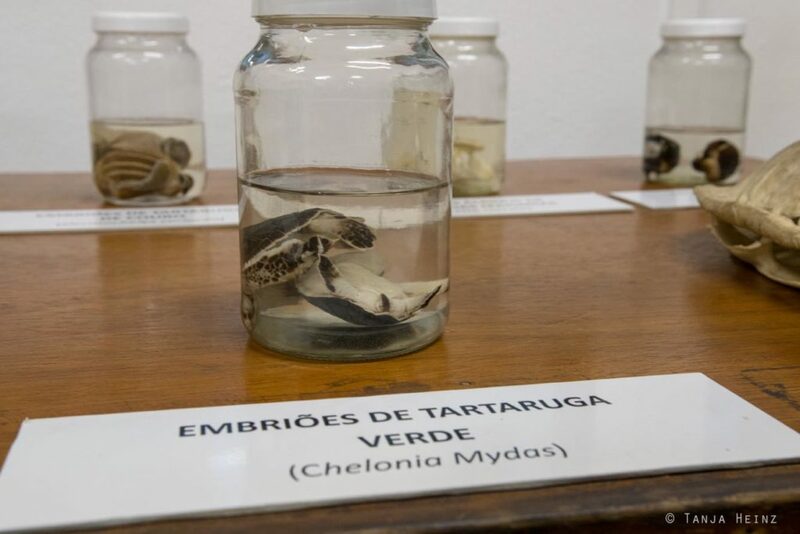 Consequently, there are about 80 marine turtles at the visitor centers of the Projeto TAMAR. About 60% of them are still not adult (in April 2018). Five different marine turtle species occur in Brazil, but only four of them live at the visitor centers of the Projeto TAMAR. 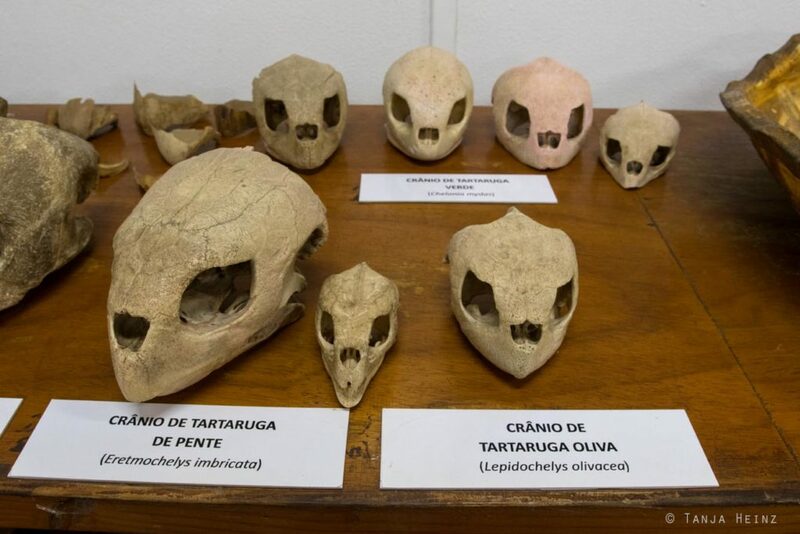 That means, the hawksbill turtle (Eretmochelys imbricata), the loggerhead turtle (Caretta Caretta), the green turtle (Chelonia mydas), and the olive ridley turtle (Lepidochelys olivacea) can be seen in the visitor centers of the Projeto TAMAR. But not the leatherback turtle (Dermochelys coriacea). Among all young marine turtles at the Projeto TAMAR most of the them are green turtles (41%) followed by loggerhead turtles (33%). In contrast, most adult marine turtles belong to the loggerhead turtles (58%). Of course, this can change again. We visited the Projeto TAMAR in April 2018. 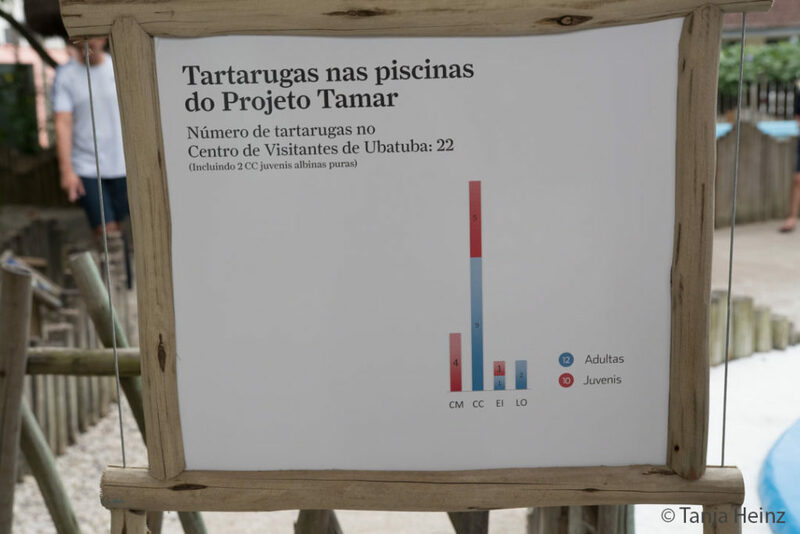 Maybe 80 marine turtles distributed among the visitor centers of the Projeto TAMAR sounds like a high number. However, consider here again, all marine turtles that live at the Projeto TAMAR do not have good survival chances in their natural habitat for a variety of reasons. And if you compare this number with the number of released young marine turtles since the beginning of the Projeto TAMAR, then this number of 80 individuals does not seem to be high anymore. 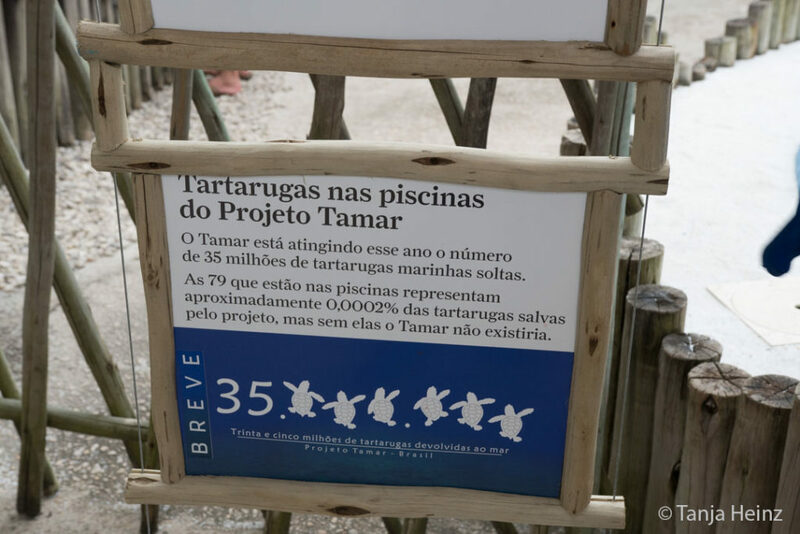 In 2018 the Projeto TAMAR reached the number 35.000.000 of released young marine turtles. That means, since the beginning of the Projeto TAMAR, 35.000.000 marine turtles hatched under supervision of the Projeto TAMAR and were released again. When compared to the marine turtles at the visitor centers, the 80 marine turtles at the visitor centers correspond to 0.0002% of all released marine turtles. 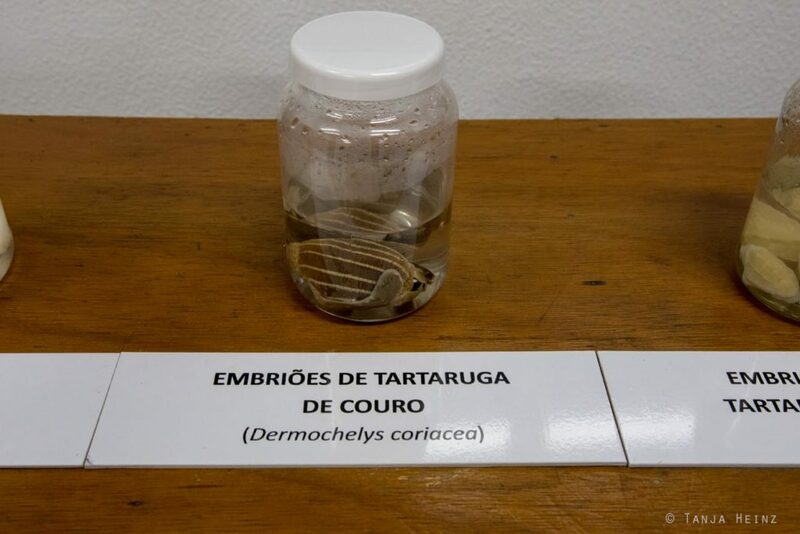 Maybe now you ask yourself: Why does the Projeto TAMAR have to release marine turtles? Unfortunately, the habitat of the marine turtles often overlaps with the one of humans. Therefore it is sometimes necessary that marine turtles can hatch under supervision. Marine turtles are exposed to several threats including human development along the coasts. In other words: we take away the habitat of the marine turtles. Therefore it is so important that marine turtles can hatch under the protection of the Projeto TAMAR. However, this does not mean that marine turtles are now safe and not exposed to any other threats after hatching. Marine turtles will encounter especially many different human-related threats in their natural environment after hatching like, for example, entanglement in fishing nets, climate change and pollution . In some parts of the world people even hunt them for their meat. The visitor center in Ubatuba is like the one in Vitória located in the middle of the city or town, respectively. The Projeto TAMAR in Ubatuba is situated in the quarter Itaguá, and thus, easy to reach. Our Airbnb accommodation was just around the corner. We visited the Projeto TAMAR on a Sunday afternoon in April. There were quite many visitors at the Projeto TAMAR on this day. Especially parents and their children were among the visitors. 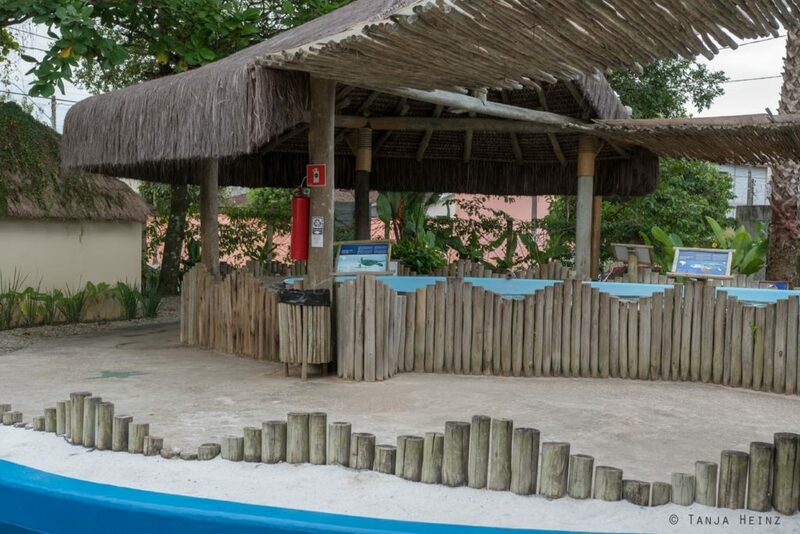 Just next to the entrance area you will get more information about all five marine turtles that occur in Brazil. I knew the five marine turtles already from the visitor center of the Projeto TAMAR in Vitória. If you pass the entrance area you will see the first pools with marine turtles. We had a nice conversation at the pool with a future biologists who was at the Projeto TAMAR for an internship. We listened intently and interested to her story, motivation and her efforts to engage in the protection of marine turtles in Brazil and in conservation in general. Occasionally a marine turtles appeared at the water surface close-by. During our conversation we got to know a lot about the biology of marine turtles. 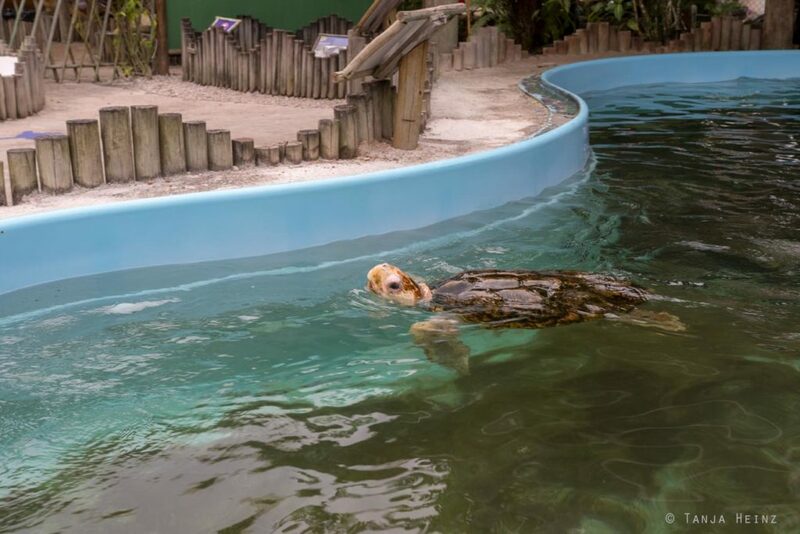 For example, we learned that marine turtles can stay under water for about ten to thirty minutes on average. They appear at the water surface only for two to three seconds to breathe and disappear again. In some situations marine turtles remain at the water surface for a bit longer. For example, when they come to the water surface to warm up or when they are searching for food. At the visitor center in Ubatuba live about 22 marine turtles (April 2018). Most of them are loggerhead turtles (5 young and 9 adult animals). Among the green turtles there are only four young individuals. 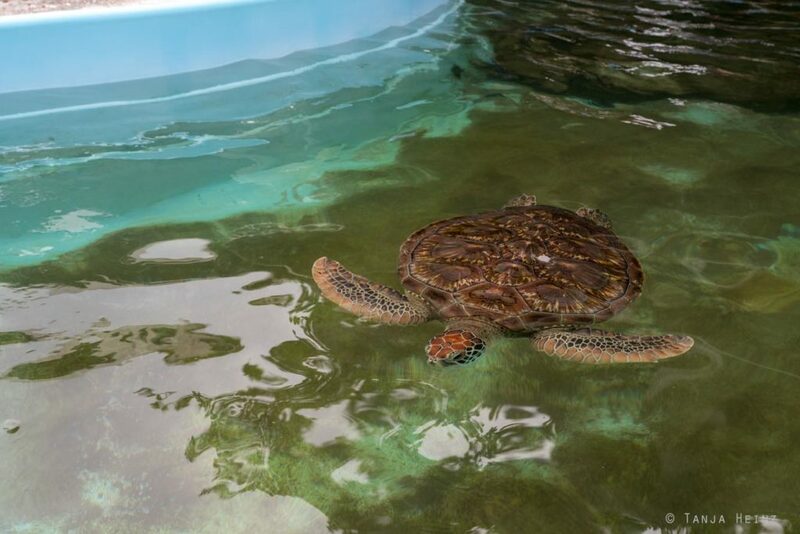 Hawksbill turtles and olive ridely turtles are represented at the visitor center in Ubatuba each by two individuals. 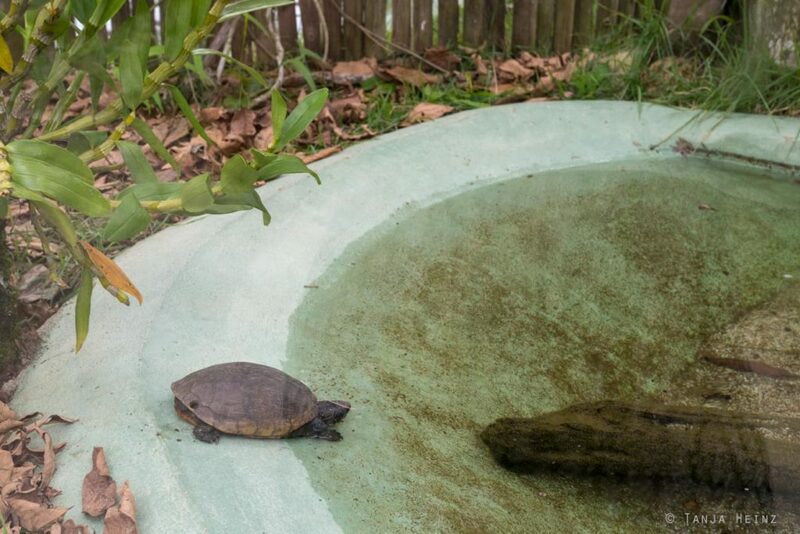 The Projeto TAMAR in Ubabuta hosts not only the 22 marine turtles, but also freshwater turtles. Like for example the scorpion mud turtle (Kinosternon scorpioides). Naturally, scorpion mud turtles live in the Amazon. Nevertheless, the Projeto TAMAR has so much more to offer. 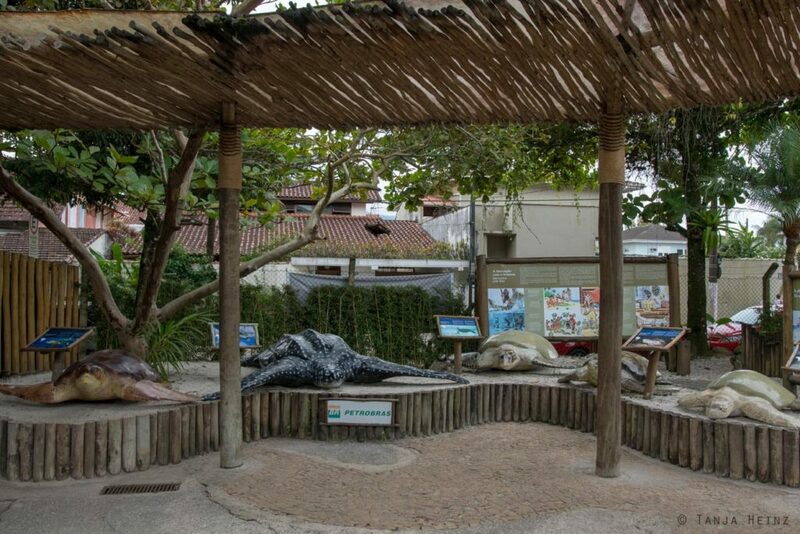 You cannot only watch at marine turtles, the visitor center in Ubatuba has also great educational opportunities. They have a library where you can find a vast number of books and magazines where you can learn more about marine turtles and conservation in general. The library is a good place for both children and adults. As we visited the Projeto TAMAR in the afternoon and as we talked with the intern and other employees for a long time, it was getting dark already and we had not so much time left. So we decided to go through the exhibition room. 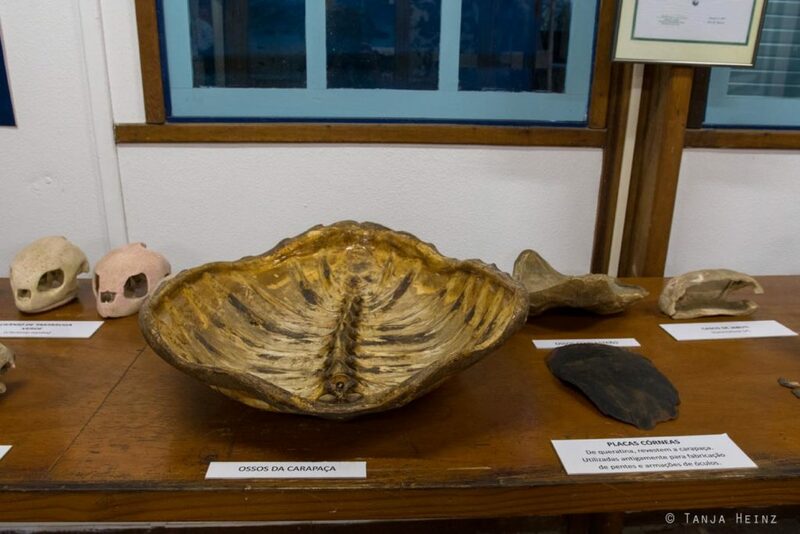 The exhibition room was filled with several exhibition pieces and information about marine turtles. 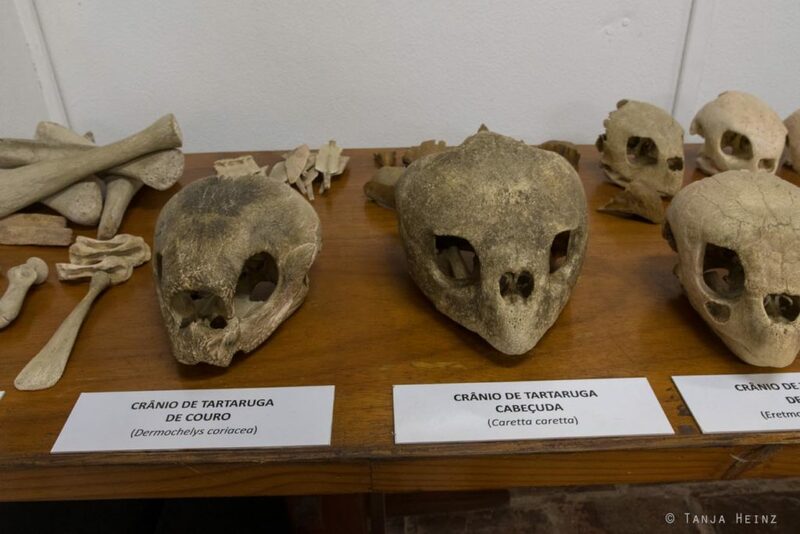 We saw turtle shells and cranial bones from marine turtles among the exhibition pieces. 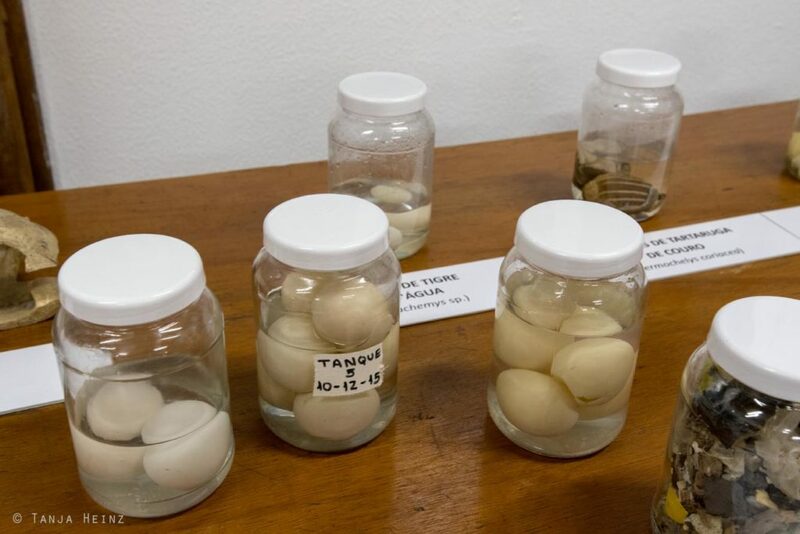 Bony plates, marine turtle eggs and embryos as well were among the exhibition pieces at the visitor center in Ubatuba. If you take a look at the embryos of the different marine turtles, you can recognize the different appearance of the marine turtles. There was even an embryo of an albino loggerhead turtles. 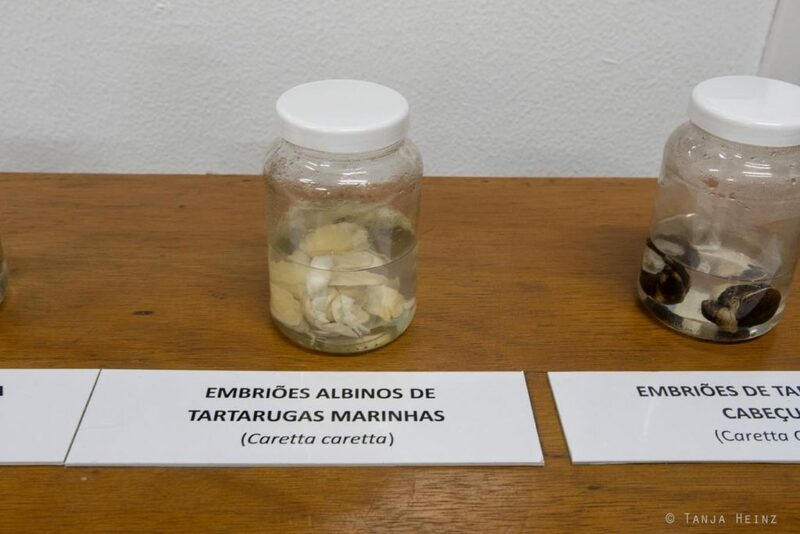 Of course, you can learn a lot about the biology of marine turtles at the Projeto TAMAR as well. Marine turtles do not have gills like fishes, but lungs. Therefore marine turtles have to come to the water surface in order to breathe. Did you know that marine turtles are able to reduce their metabolism and heartbeat in order to stay under water for a longer time? Marine turtles come to the water surface in order to breathe and get oxygen. However, they can economize the oxygen they got from the water surface when they reduce their metabolism and heartbeat. 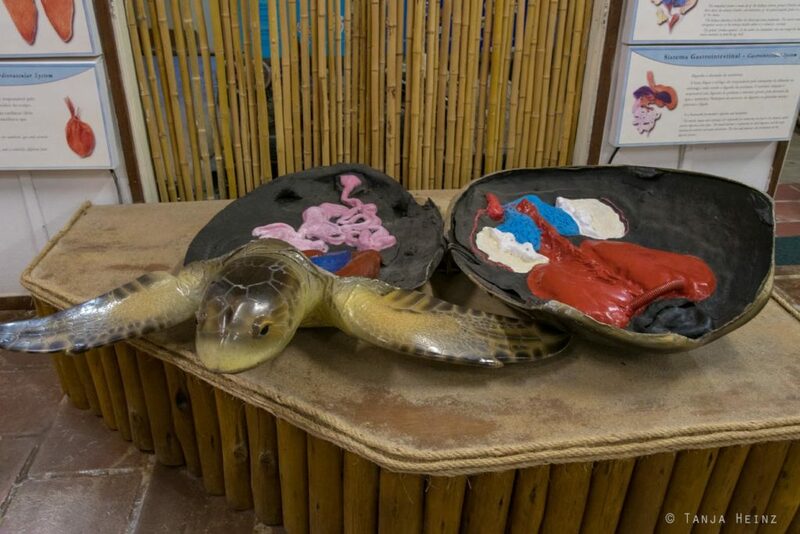 Of course, there is much more to learn about marine turtles at the visitor center if you take the time. In the exhibition room you will encounter again and again information about all threats marine turtles are exposed to. One of those threats is marine pollution. 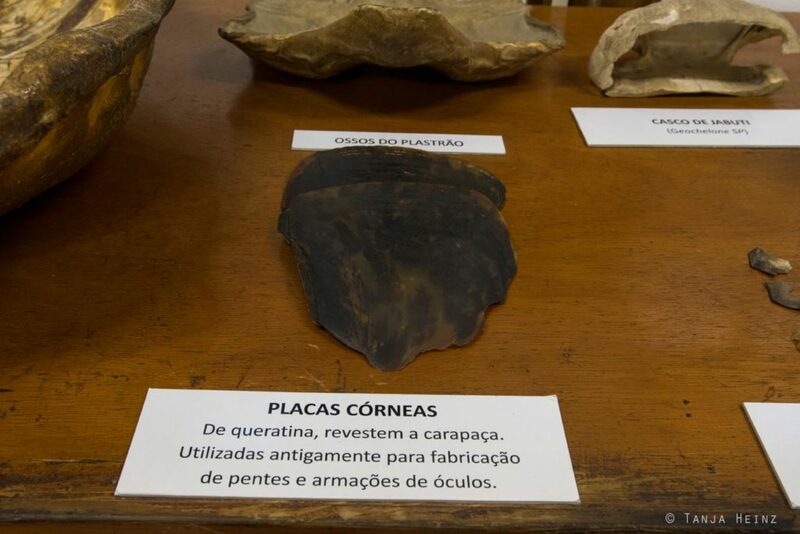 Things like canisters, tires or styrofoam are often found, and thus, got a place in the exhibition room of the Projeto TAMAR. Marine turtles are exposed not only to human-induced threats. They are also exposed to several natural threats. Like predators for example. However, marine turtles are especially vulnerable when they are very conspicuous. Of course, the albino marine turtle is quite attractive for most visitors because of its unusual appearance. 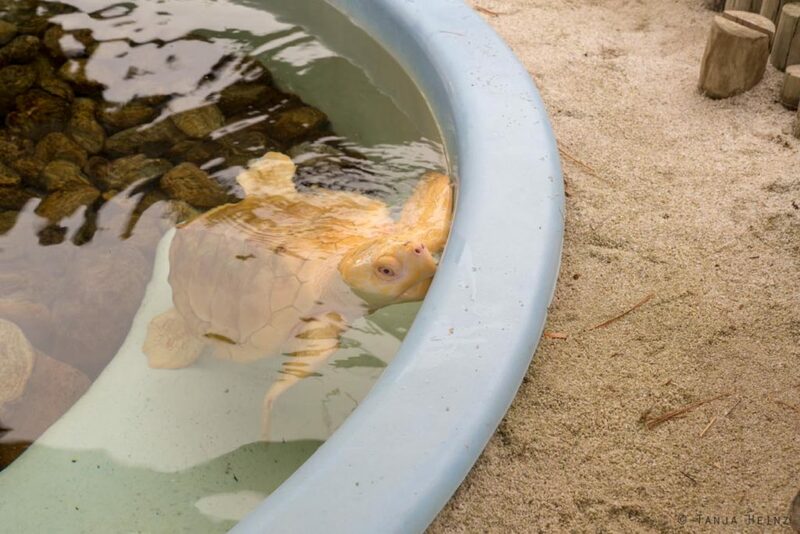 We had heard about this albino marine turtle in Ubatuba already at the Projeto TAMAR in Vitória. One of the employees showed us with great enthusiasm a video about the albino marine turtle as she went to the visitor center in Ubatuba a few months before. 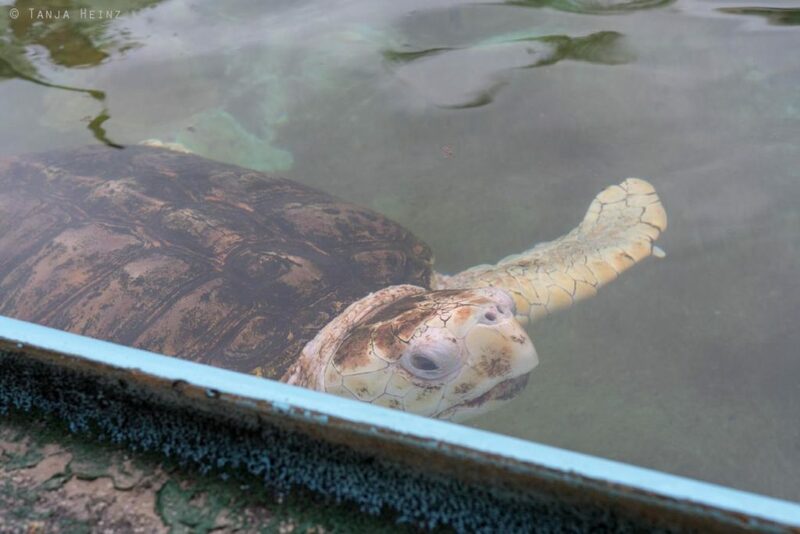 By the way, the albino marine turtle at the visitor center in Ubatuba is a loggerhead turtle. 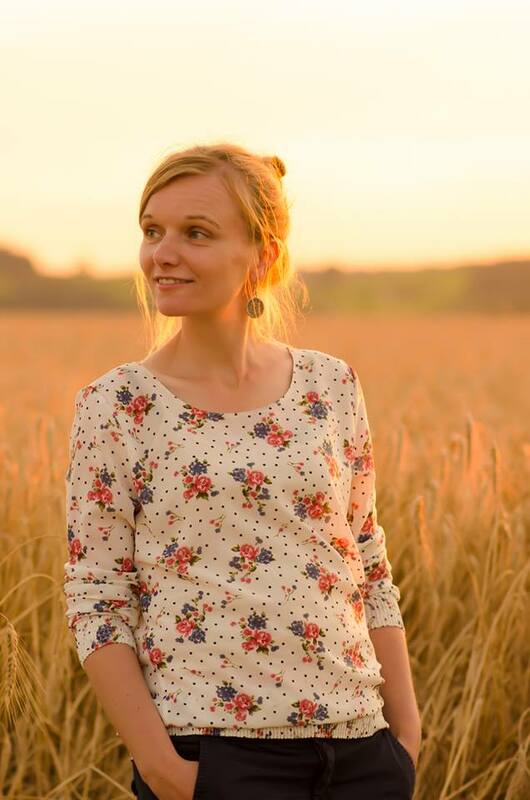 She was born on the 20th December in 2014 in São Francisco de Itabapoana in the state Rio de Janeiro. In total, 118 marine turtles hatched from the same nest and eight of them were albinos. In general, it is estimated that only 1 out of 1000 hatched marine turtles will survive until adulthood. And this has several reasons, including natural ones. When marine turtles hatch, they are most vulnerable and exposed to several predators like sea birds, crabs, octopuses or fishes. As albino marine turtles are more conspicuous due to their appearance their chances of survival are very low. Albino marine turtles, but also other albino animals (humans as well by the way) lack a gene that normally contains information about the pigment melanin. If the gene is defect, melanin cannot be produced. We observed the albino marine turtle for some time. Again and again the marine turtle swam to the edge of the pool and looked out of the water. By the way, most albinos are not able to see sharply. Another reason why their chances of survival are lower in their natural habitat. Although the Projeto TAMAR is a great project and in my opinion very important to visit and support, of course, I was also a little bit sad to see these wonderful animals in pools and not in their natural environment. 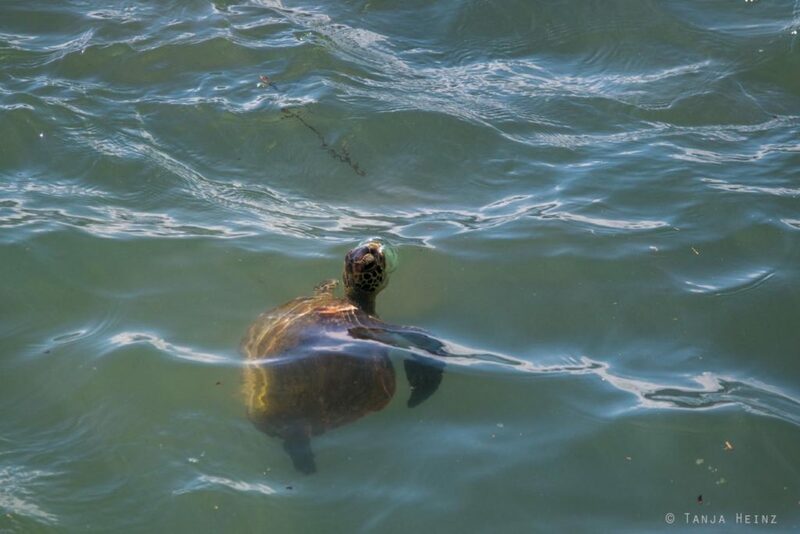 However, as we heard that it is possible to see marine turtles in Ubatuba in the wild (not at the beach), on the next day we headed to Ponta Grossa where apparently marine turtles occur in the waters. 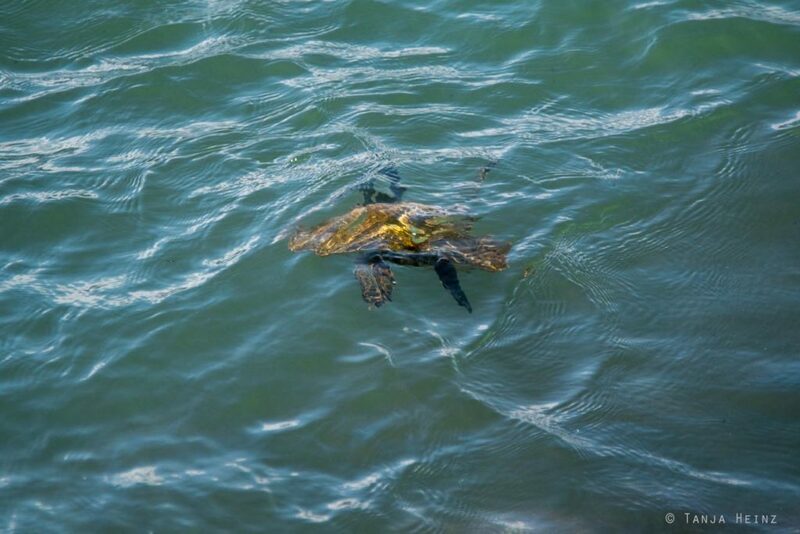 If you want to see marine turtles in the wild close to Ubatuba, you do not have to walk a long distance. 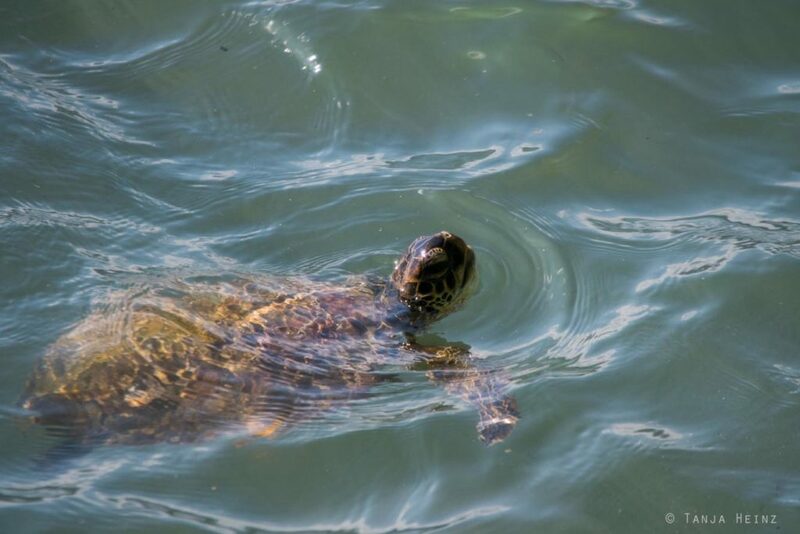 Because in the waters of Ponta Grossa live some marine turtles. At first you have to walk along the beach in the quarter Itaguá. 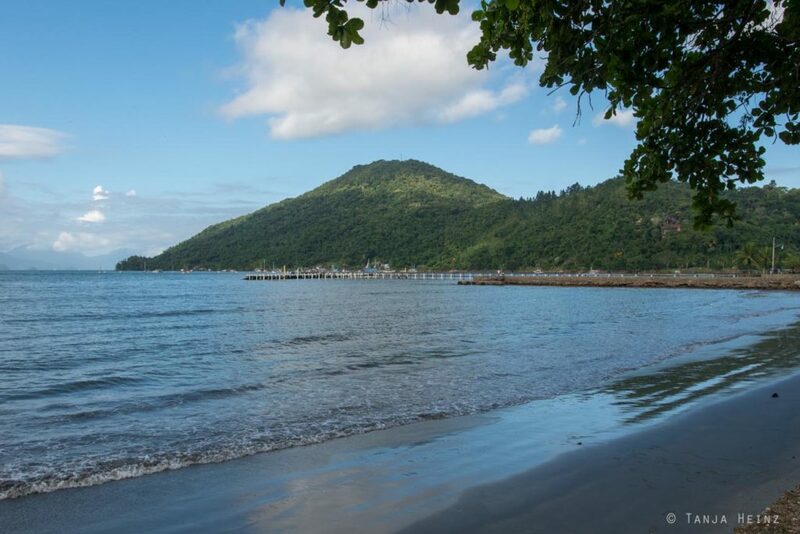 Ubatuba has many beaches to offer, but the beach in the quarter Itaguá is rather not a beach for sunbathing. At this beach you will see many boats that leave the beach. At the Estrada do Porto we turned left. The path of the Estrada do Porto leads not directly to the tip of Ponta Grossa where you can find as well a lighthouse. We decided to take this path, because it was easier to reach from Itaguá and we really had some nice views onto the sea. 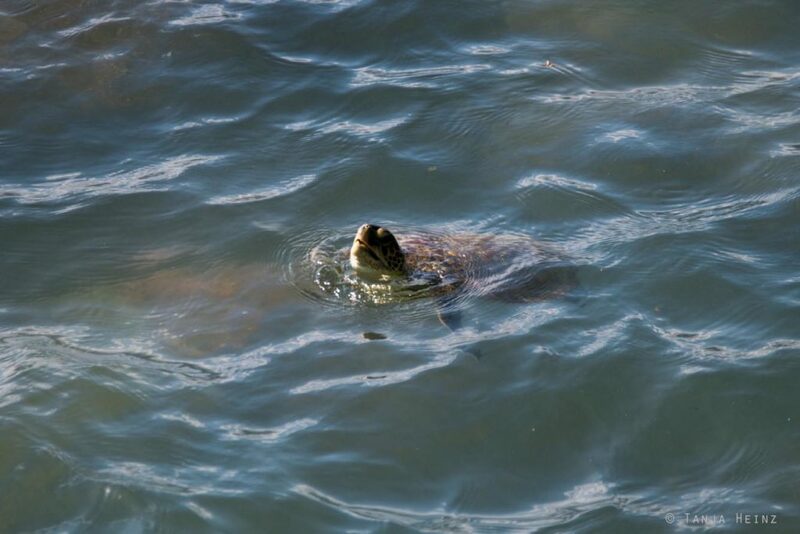 When we reached the end of the path we saw some marine turtles emerging at the water surface again and again. However, mostly the marine turtles came to the water surface only for a few seconds and disappeared again. It was not easy to take a photograph of the marine turtles. Sometimes they remained under the water for a long time and we thought that they might have swum away. Close to our observation point were some teenagers jumping into the water. However, apparently this did not bother the marine turtles. Sometimes even quite close to our observation point. They were coming and going. Just one marine turtle remained at one specific point for quite a long time. It submerged and remained under the water, but came to the water surface again and again. As the water was quite clear we could observe that this marine turtle was looking for something under some stones. Was the marine turtle searching for food? We could not really see what was she was doing exactly. But she came to the water surface again and again for a few seconds and disappeared again under the water. Finally it was time for us to leave as more and more clouds were approaching. Actually it was not the first time for me to see marine turtles in the wild at the Ponta Grossa in Ubatuba in Brazil. I met free-living marine turtles already in Australia. There I met them while snorkeling, but also from land. This was in Heron Island. I’m already excited where I will meet marine turtles the next time. Ubatuba is especially known for its beaches, and thus, a popular vacation destination for Brazilians. 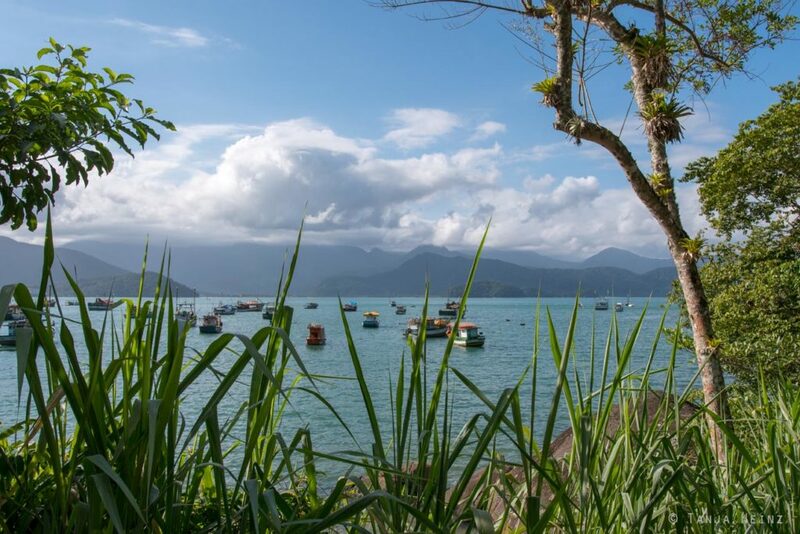 However, besides sun and beaches Ubatuba is home to one of the most important nature protection organizations of Brazil: the Projeto TAMAR. 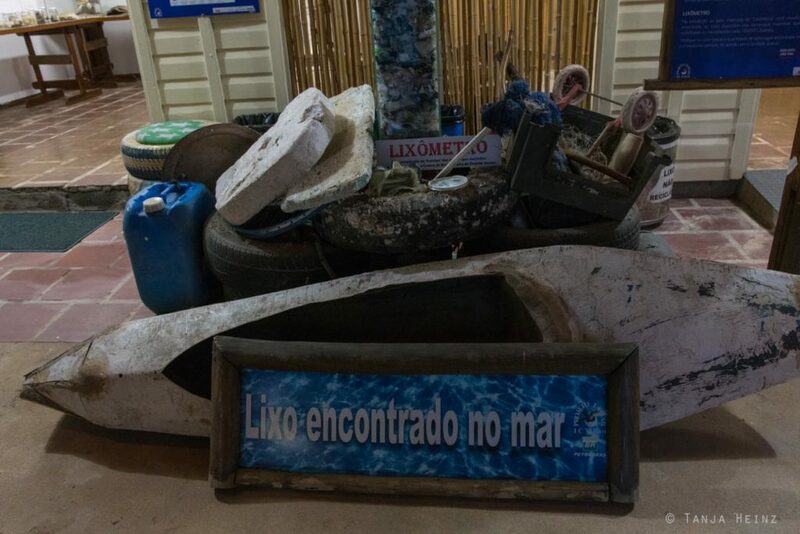 The Projeto TAMAR is actively engaged in the protection of marine turtles in Brazil. 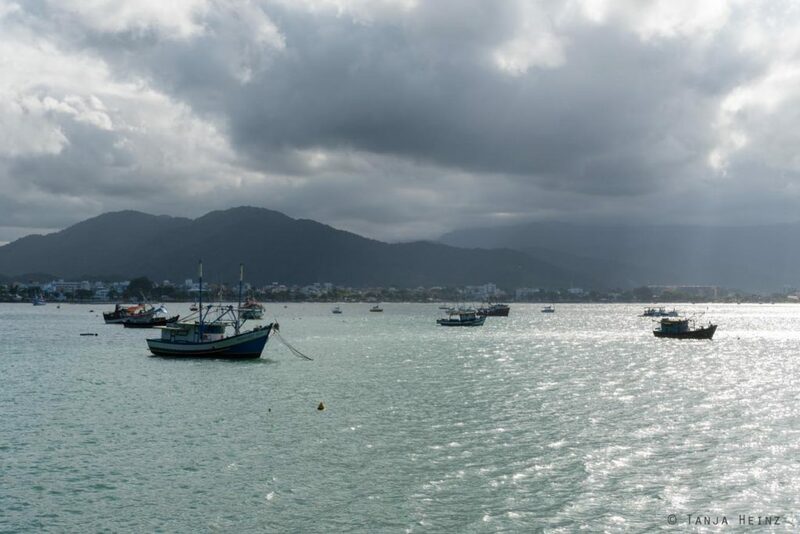 It is an important education institute which brings the protection of marine turtles closer to its visitors and which raises awareness for nature protection in general. From Rio de Janeiro or São Paulo to Ubatuba you need to drive about 300 or 200 kilometers, respectively. 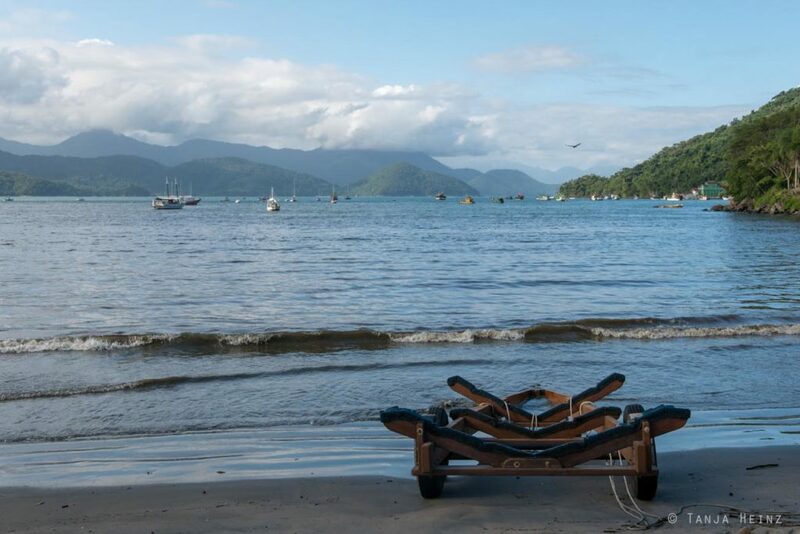 There are two direct buses each day from Rio de Janeiro to Ubatuba. The bus company Util leaves each day once early in the morning and once shortly before midnight. From São Paulo to Ubatuba there are more direct buses with the bus company Litorânea during the day. You can buy bus tickets either online via Clickbus or via Brasil by bus. If you do not want to buy tickets online, you can buy them as well at the ticket counter of the respective bus company. As we came from Itacuruça first we had to go back to Rio de Janeiro. 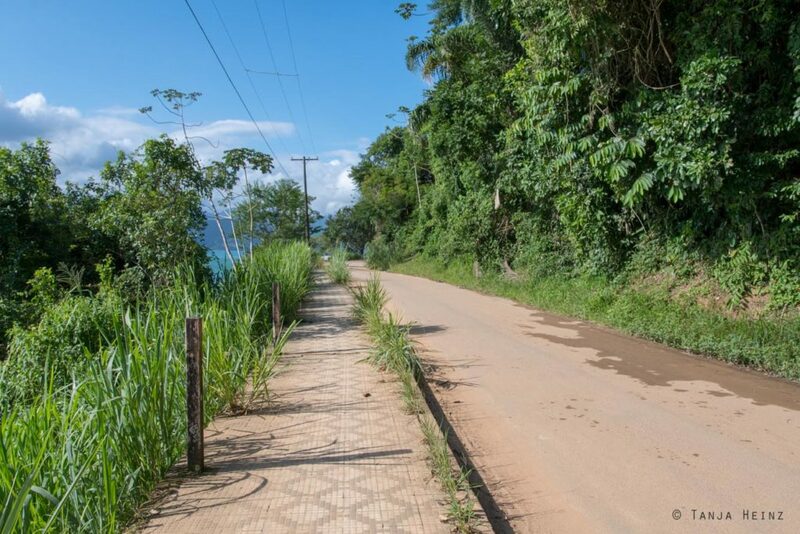 There was no bus leaving from Itacuruça to Ubatuba. At first we took a local bus from Itacuruça back to Itaguaí. From Itaguaí we took another local bus that drove directly to the bus terminal Novo Rio in Rio de Janeiro. As there were only two buses to Ubatuba each day and as we arrived at midday at the bus terminal in Rio de Janeiro, we had to wait ten hours for our bus to Ubatuba. We bought a ticket at the ticket counter of the bus company Util from Rio de Janeiro to Ubatuba. The journey took about six hours and we paid 107,82 R$ for each ticket. Later we heard from our Airbnb-hosts in Ubatuba that there would have been another possibility to get from Rio de Janeiro to Ubatuba. Several buses of the bus company Costa Verde leave Rio de Janeiro and drive until Paraty. 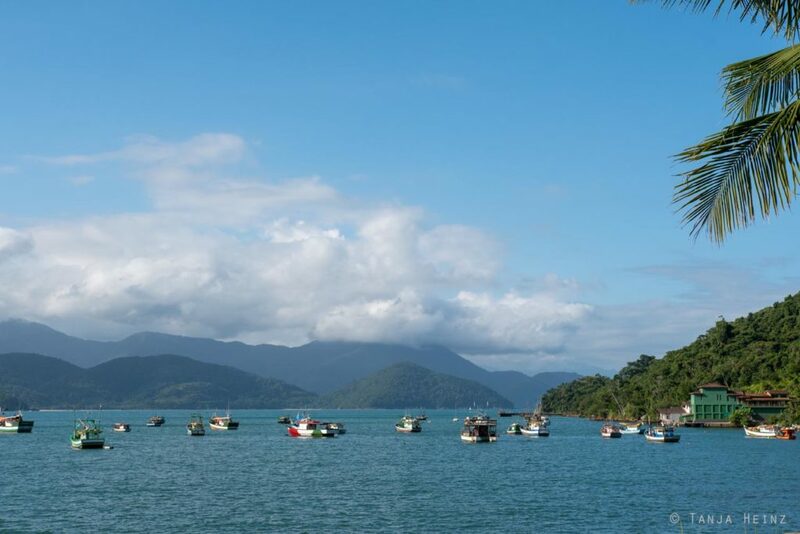 From Paraty it is possible to take a local bus to Ubatuba. 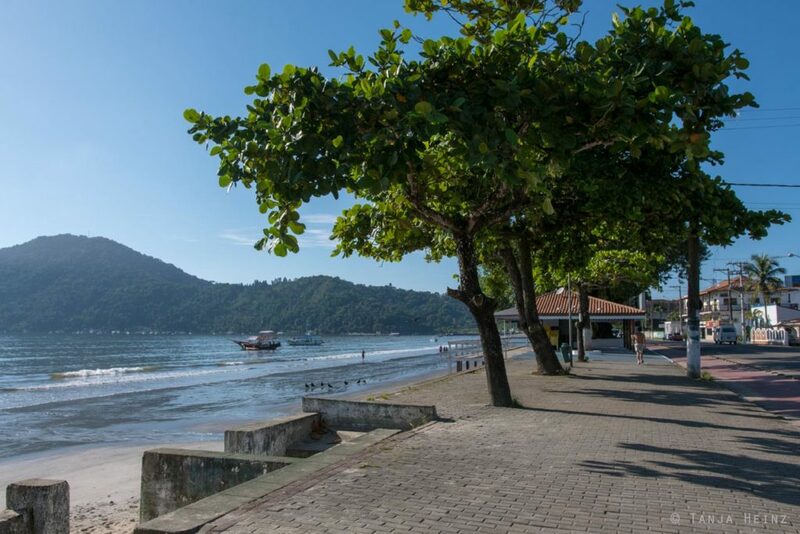 Here it is also important to mention that Ubatuba has several bus terminals depending on the bus company. Therefore, you should inform yourself very well where your bus arrives or leaves, respectively. We arrived from Rio de Janeiro in Ubatuba with the bus company Util in the street Rua Professor Thomaz Galhardo, 513 in the quarter Centro. However, when we left Ubatuba to continue with our journey in São Paulo with the bus company Litorânea we had to go to the street Rua Maria Vitória Jean, 346 in the quarter Umuarama. From Ubatuba to the bus terminal Tietê in São Paulo with the bus company Litorânea we needed about five hours and paid 72,51 R$ for each ticket. Our accommodation in Ubatuba was located quite close to the Projeto TAMAR in the street Rua Milton de Holanda Maia in the quarter Itaguá. Itaguá is a very quiet quarter. In this quarter you can also find several pousadas (guest houses). We lived in the guest house of a Brazilian family and found this place via Airbnb. The Projeto TAMAR and the beach was close-by to the Rua Milton de Holanda Maia. The Projeto TAMAR in Ubatuba is located in the street Rua Antônio Atanázio, 273 in the quarter Itaguá. The visitor center of the Projeto TAMAR opens every day at 10 a.m. for visitors. They close at 6 p.m. each day except Friday and Saturday. On these two days the Projeto TAMAR closes at 8 p.m. The entrance fee is 20 R$. You can find more information about marine turtles and the Projeto TAMAR on their Webseite.